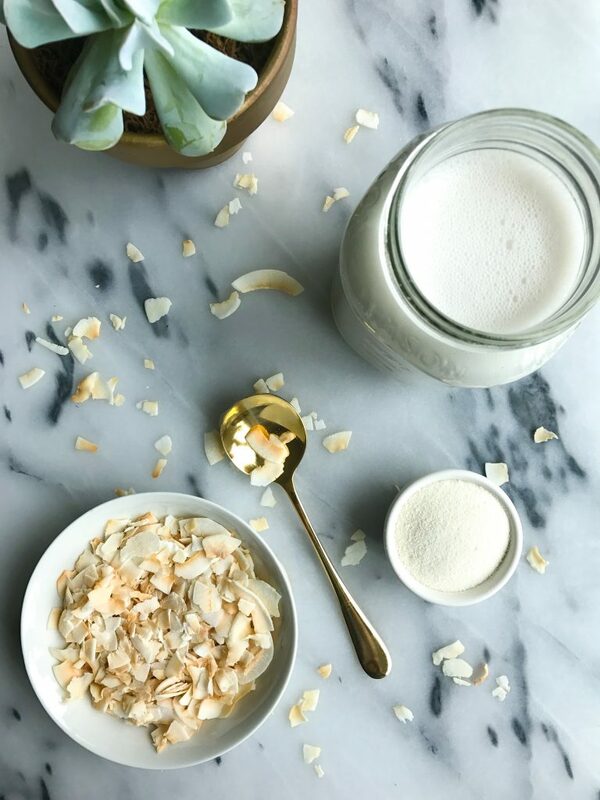 5-minute Collagen Coconut Milk made with 3 simple ingredients for an easy coconut milk! While I love the convenience of buying store-bought milk, sometimes the inner food nerd in me just loves making some homemade nut milk to enjoy. I’m not one to make the traditional almond milk (hello, that is what New Barn is for) but I love making unique types of dairy-free milks that I can’t find in the grocery store. 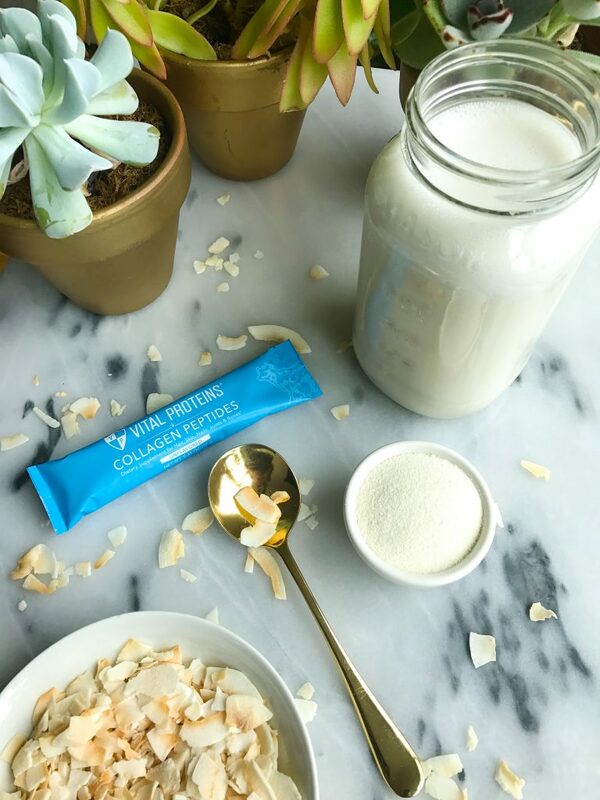 This 5-minute Collagen Coconut Milk is my latest obsession in the milk world. I go through phases where I make/use the same milk over and over again and this collagen coconut milk has been on repeat for a couple months now. I love how easy it is to make, the extra protein added from collagen peptides and the sweet coconut flavor. I add it to my smoothies, dip cookies in or just with cereal! A lot of you ask me why I use collagen peptides and if they are worth the investment. Personally, I think collagen peptides are one of the most important items in my pantry. I love how versatile they are since they are unflavored. I’m getting extra nutrients from this magical product that dissolves in everything, and it provides extra protein anytime I use it. I use Vital Proteins collagen peptides and have for over a year now. They are one of my most valued brand partners I have and I truly believe in their product. While there is some questioning from people whether or not we actually need to add this to our diet, I like to add it daily. I travel with my Vital Proteins packets. I add to my smoothies or even just hot water with lemon! Collagen is the vital building block of our bodies including hair, skin, nails, bones and joints. Our bodies do not synthesize enough collagen on their own and most of our diets don’t contain enough collagen in it. I love that Vital Proteins is flavorless and odorless. It mixes easily into liquids and can provide 20g collagen protein. Obviously everyone is different so your reaction to collagen could be so different than what I experience. I use a variety of Vital Protein’s products but I recommend starting the with marine collagen or collagen peptides. Both excellent options! You can’t go wrong. Do you use collagen? What are your thoughts? 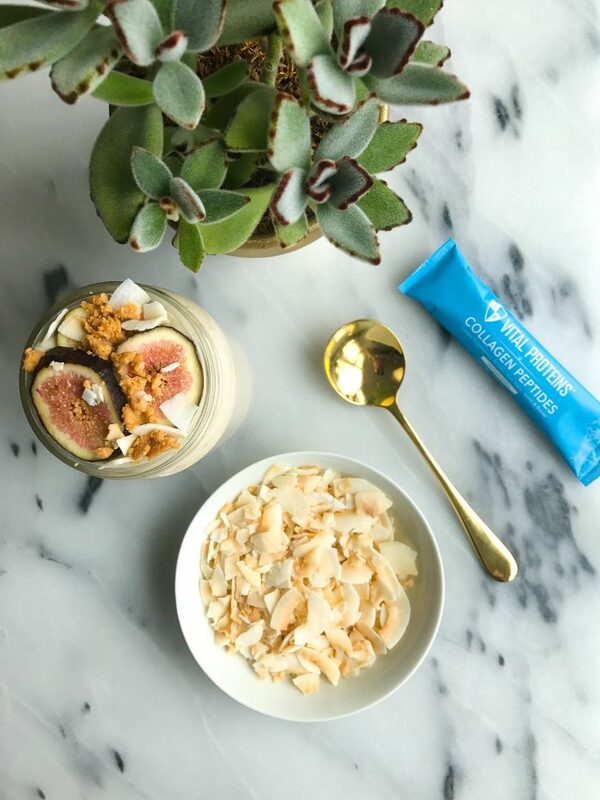 In case you need some recipe inspo using collagen peptides, I gotcha covered..
Store in mason jars or storage of choice in fridge and enjoy with 3-4 days! Thank you Vital Proteins for sponsoring this post. It means so much to me to work with brands that I love and who support rachLmansfield! Thanks for sharing this, Rachel! I’ve been curious about collagen for a while and after seeing how simple you made this, I think I’ll have to try it! Should the coconut flakes be toasted before adding in? Love love love your recipes. Just read the coconut collagen recipe and am going to make it in a few mins. I even thought wow u can add cocoa to make a chocolate version… thank you so much. Now going to explore your page more.